Independent investigative reporting projects seem to be on the rise, especially in developing nations. Gustavo Gorriti is an experienced Peruvian journalist who decided to establish an independent team of investigative journalists, with a mission to “report, investigate, uncover and publish the events and subjects that hurt the rights, property and the destiny of people“. Peru is a democracy with a high level of corruption, and Gorriti set out to put journalism at citizens’ disposal and make the powerful accountable. The result? IDL-Reporteros. Jacqueline Fowks is part of this team and she explained to Journalism.co.uk why projects like this are so important. [JF] The audience is still expecting investigative journalism stories today, the role of the press as a watchdog has not disappeared yet. In Peru – as in most Latin American countries – newspapers publish less investigative stories every day and the investigative teams decline or vanish. As global investments increase – and as state corruption climbs to higher levels in Peru (in concessions, mining, energy and public infrastructure) – there is an urgent need to dig deeper. Why does it take an independent enterprise to do it? Has mainstream media pulled itself out of the game? [JF] Even though polls demonstrate that there is a massive rejection of politicians, news media do not necessarily follow, investigate and report about corruption. Investigating corruption takes a lot of time and some amount of resources: most newsrooms decide not to invest on it, some lack staff and resources. Others just do not want to make politicians and companies accountable. IDL-Reporteros started in October 2009 with a team of two and it is backed financially by the Open Society Institute, a foundation that promotes democracy and human rights-supporting initiatives that help shaping public policies and fight corruption and rights abuses. In January 2010 the whole team was completed and now they have four reporters/writers, an administrative assistant, an IT assistant and the director. There is no print edition, so all the stories are published on the website. Feedback so far on the initiative has been quite good. “There have been important and supporting comments every time we publish a special feature story in our website. Similar comments have appeared on Twitter and on our Facebook wall. 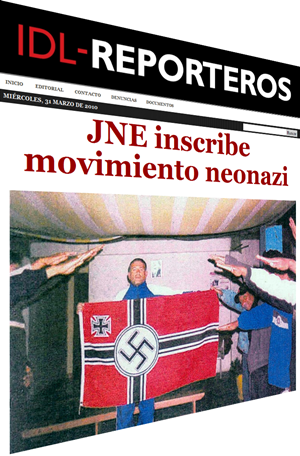 The Peruvian mass media has also echoed and covered the stories IDL-Reporteros launched,” says Fowks. Staff: Four reporter-writers, an administrative assistant, an IT assistant and the director. Funding: IDL-Reporteros receives a grant from the Open Society Institute. This entry was posted in Online Journalism and tagged Gustavo Gorriti, IDL-Reporteros, investigative journalism, Jacqueline Fowks, news media, Open Society Institute, Peru on April 8, 2010 by Alexandre Gamela.